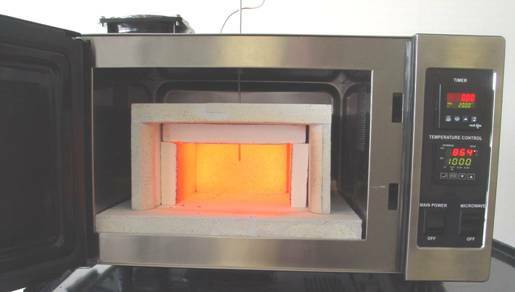 sample preparation, Loss on ignition (LOI) testing and ashing of samples. The BP-120 is a high temperature LOI/Ashing microwave with simple user selectable “time at temperature” control settings. The timer and temperature controller are programmed by the user. The timer begins timing once the temperature controller reaches its programmed temperature. The temperature controller maintains the muffle air temperature to the programmed value. The timer and temperature controller are very straightforward and simple to program. To further ease programming, there is a printed quick start instructions mounted to the cover. 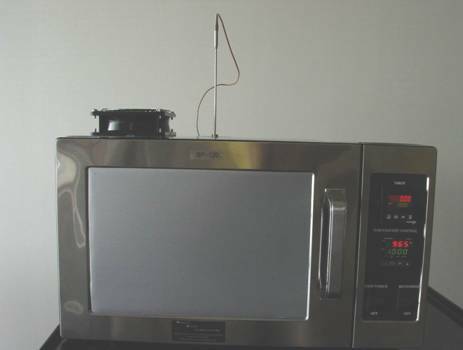 The microwave produces 1,000 watts of microwave energy for fast heating and ashing. Included is a muffle inside the microwave that protects the microwave from the heat generated. The muffle has removable inserts with microwave susceptor that convert the microwave energy to thermal heat. The inner muffle is 6” x 6” x 3 ½” tall. The temperature inside the inner muffle can increase from 20 ºC to 1,000 ºC in under 35 minutes when empty. Sample heating times depend on the sample loads inside the muffle. Simplified timer and temperature control – timer begins timing process once desired temperature is reached. Quick program operation instructions on the microwave cover just above the control panel for easy use. Susceptor coated inner muffle (left side, right side, rear and top) are replaceable should they need to be replaced. Meets US FCC requirements and can be tested for Canadian CSA requirements.